Fri., Nov. 24, 2017, 4:59 p.m.
SEATTLE – With Washington struggling to put away crosstown rival Seattle University, freshman Jaylen Nowell took control of the game by relentlessly attacking the basket. Nowell finished with 25 points as he converted nine free throws over the final 4 minutes, 13 seconds to help Washington hold off Seattle 89-84 in nonconference men’s basketball on Friday. Washington converted its final 19 free throws – with 12 of Nowell’s points coming from the line. “They were in the bonus fairly early, so we just made it a point to just go at them,” Nowell said. Matej Kavas scored 25 points to lead Seattle (2-4), which fell just shy of beating the Huskies for the first time since returning to Division I in 2009. Matisse Thybulle added 18 points and David Crisp had 16 for the Huskies, who improved to 3-2 on the season. Both teams shot 28 of 58 from the field (48 percent), while Seattle was more potent from 3-point territory with 12 makes. The Redhawks kept it close in the first half with the benefit of 11 second-chance points. Seattle got hot from distance after the break, going 7 of 15 from 3-point territory. The Huskies’ ability to get to the line proved the difference, going 25 of 30. “The game was won making 19 straight foul shots to end the game. These guys found a way against a really tough opponent that gave us everything they got,” Hopkins said. Washington built a 21-11 lead over the first 9 minutes, only to see the lead evaporate before the break. A 3-pointer from Richaud Gittens gave Seattle a 60-59 lead with 12:05 remaining, but Thybulle answered with a 3 to wrestle the lead back. Seattle closed to within 81-80 with 1:28 remaining on a pair of free throws by Josh Hearlihy. Nowell converted two free throws with 32.9 seconds remaining to give Washington an 85-82 cushion. After a turnover by Aaron Nettles, Nowell hit four foul shots in the closing seconds. “We’ve got to get a lot better and we’re striving to be better every day,” Hopkins said. Washington freshman Michael Carter III is expected to miss 6-8 weeks after sustaining a broken hand. Carter was averaging just less than 6 minutes a game. 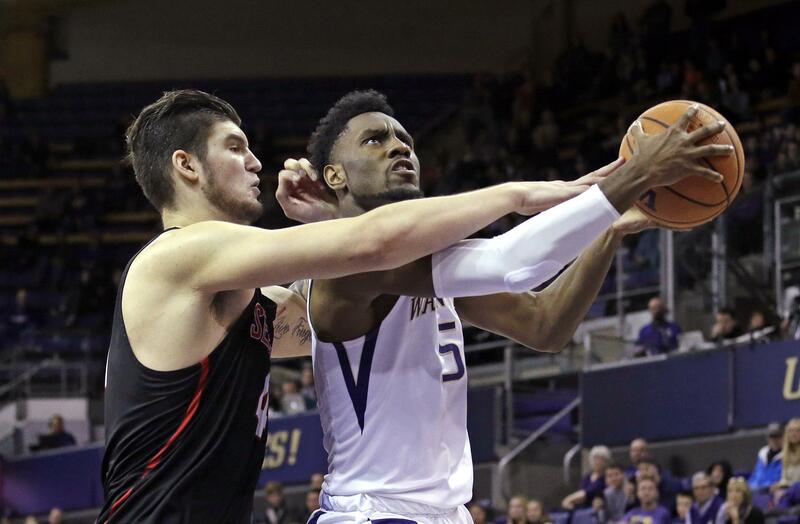 … UW junior forward Devenir Duruisseau has left the team and will look to transfer after the academic year at Washington. He is on pace to graduate this spring and will be eligible to play elsewhere next season. He appeared in one game this year, recording less than a minute of court time. Published: Nov. 24, 2017, 4:59 p.m.